Cortisol, often referred to as "the stress hormone," can play a big role in our adrenal and overall health. When levels are out of balance, our whole lives can feel out of balance. 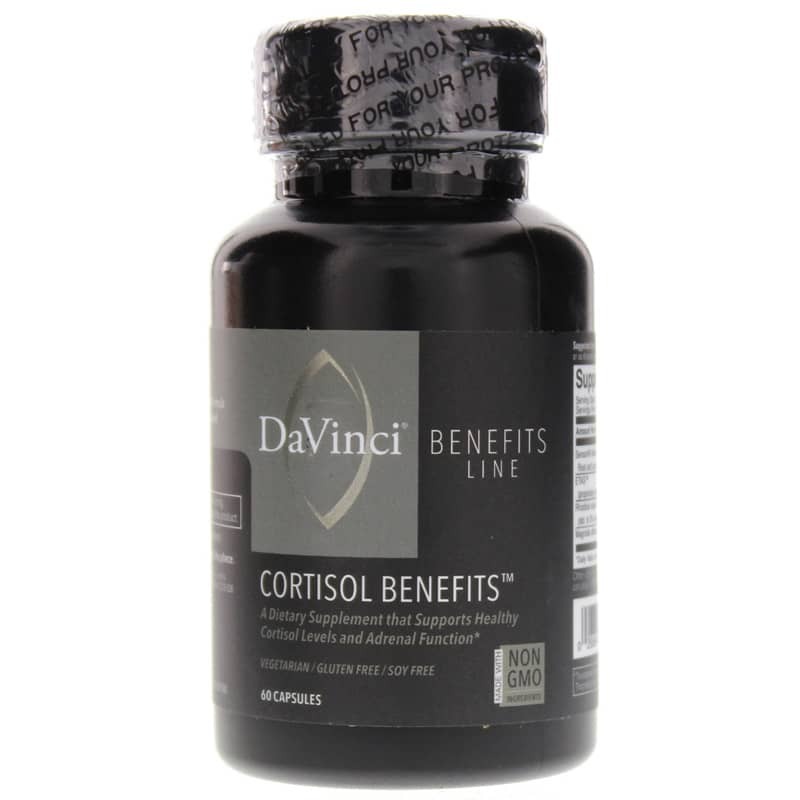 Help keep things on an even keel with Cortisol Benefits from DaVinci. Cortisol Benefits contains a blend of three high-quality formulations of natural herbs to provide support for cortisol balance to help maintain adrenal health and optimal feelings of wellness. Sensoril Ashwagandha - A high-concentrate extract from the roots and leaves of ashwagandha, this ingredient provides support in times of stress, helping to maintain energy, mental acuity and concentration. Ashwagandha is known as an adaptogenic herb and may help the body adapt to stress. 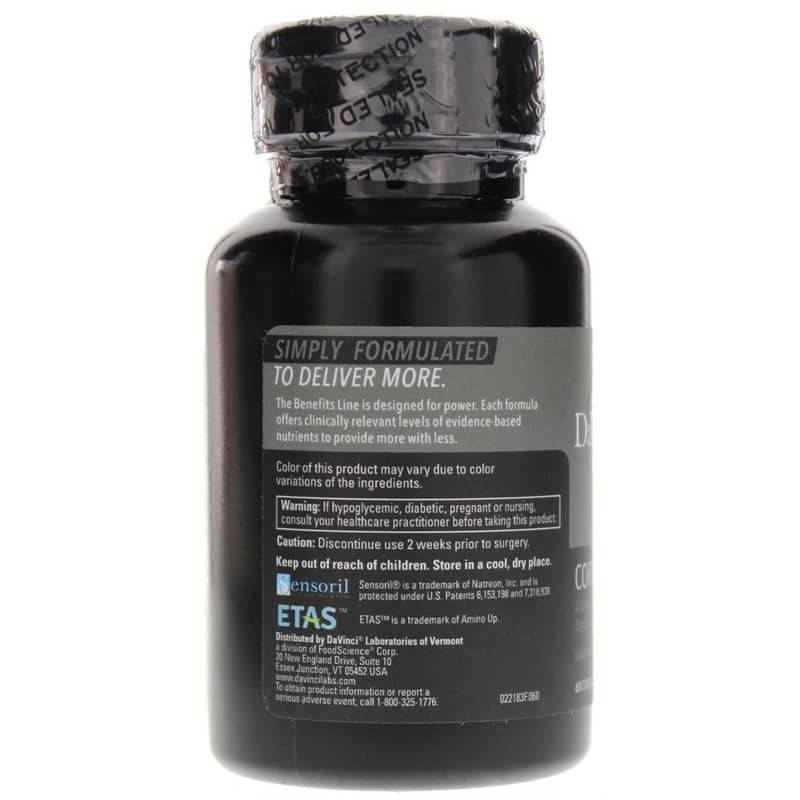 ETAS - ETAS is a proprietary extract derived from asparagus stalks and may support normal production of HSP70, a protein that supports factors such as excitatory/inhibitory cytokine balance and oxidative balance for a healthy stress response. Rhodiola rosea Root Extract - This herb may provide support for several aspects of a healthy stress response, including the production of cortisol. Magnolia Bark Extract - Magnolia bark extract helps support normal levels of cortisol and DHEA to help maintain healthy stress management feelings of relaxation and well being. 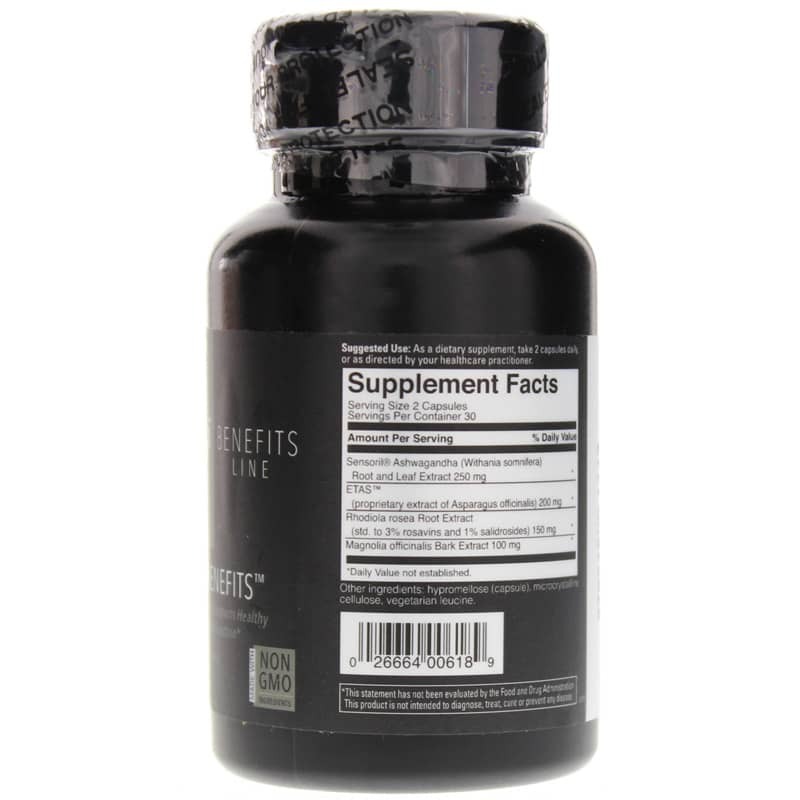 Get natural support against stress. Order Cortisol Benefits. Contains NO: gluten, soy. Vegetarian. Non-GMO. Adults: As a dietary supplement, take 2 capsules daily, or as directed by your healthcare practitioner. If hypoglycemic, diabetic, pregnant or nursing, please consult your healthcare professional before using this product. Caution: Discontinue use 2 weeks prior to surgery. Keep out of the reach of children.